In Chapter 6 of Bhagavad Gita, Arjuna asks Lord Krishna, whether the sadhanas of a sadhaka, who dies before attaining his goal of Self-realization, be wasted efforts only, himself losing both the spiritual goal and material pleasures (6-38,39). In his reply Lord Krishna assures Arjuna that the sadhanas will not go in vain and then states that in the next birth he will be born in a pious and wealthy family or in an enlightened Yogi’s family to continue his sadhanas. He goes on to describe what happens in the latter case, which is a rare one indeed, in verse 6-43 which is quoted below. O Arjuna! There he automatically acquires the knowledge gained in his previous birth and from there he continues his sadhanas for Self-realization from where he left off (in the previous birth). This we can see in the life of Venkataraman, who later blossomed into Ramana Maharishi. Venkataraman was born to a devout couple, Sundaram Aiyer and Alagammal, in the village of Thiruchuzhi, near Madurai. He was born on 30th Dec. 1879, Arudra Darsan day, a day auspicious to all devotees of Lord Siva. Venkatraman had his early education in the elementary school in the village and then for a year in a school in Dindigul. When he was twelve, his father died and he along with his elder brother moved to Madurai to live with his father’s brother, Subbhaiyer. Here he studied in Scott’s Middle School and then in American Mission High School. As a student, he was more interested in games like football, wrestling and swimming rather than studies. He was a healthy strong lad with a very good memory and he could sleep soundly totally oblivious to things around him and about him. He did not show any inkling of his spiritual urge until he heard the name Arunachala at his age sixteen. An elderly relative who was visiting his family told him that he is coming from Arunachala. The word Arunachala had a magical effect on him touching a sensitive spot in his subconscious. He wanted to know more about Arunachala and learnt about Tiruvannamalai and Lord Arunachaleswara from this relative. If this sowed the seed of spiritual awakening his reading of Periyapuranam, Sekkizhar’s account of 63 Saivaite saints, contributed to his spiritual awakening. He was deeply stirred by their spirit of renunciation and life of devotion. Crowning all this was his experiment with death, which changed his life totally. One day, in the year 1896, when he was sitting alone in the first floor of his house, fear of death gripped him. There was nothing physically wrong with him, yet he had this fear of death. He did not panic but wanted to find out what death is like. He lay down, closed his eyes, held his breadth and stretched out his limbs as if rigor mortis has set in. He then calmly analyzed in the mind, the events that take place after death, the body being taken to the burning ghat, placed on the pyre, fire being lit and body slowly going up in flames. Then as he was faking death physically and analyzing mentally, it dawned upon him in a flash that he as represented by ‘I’ is not the body or mind but it is the spirit that transcends the body and mind. That ‘I’ does not die or perish, only the body dies and perishes in fire. Thus he found himself in the peak of spiritual realization at this tender age of seventeen, without any prolonged or strenuous sadhana to speak of. What is this but a carryover from previous birth as Lord Krishna promised Arjuna. From this moment fear of death left him. Not only that, all which interested him so far, games, studies, food etc. and even relationships all held no attraction for him thereafter. He preferred solitude and meditation on self. Now he started visiting the temple of Goddess Meenakshi daily and there stand before the idols of Gods and Saints gazing enraptured with flowing tears. His elder brother Nagaswami noticed these changes and started rebuking him for his growing indifference to studies. Matters came to a head one day about six weeks after this great spiritual experience. His English teacher had asked him to copy out a lesson from Bain’s Grammar three times as a punishment for his carelessness in studies. As he was copying, the spiritual urge came to him. He set aside the unfinished work and sat in meditation. Nagaswami who was watching all this went up to him and said rebukingly “what use is all this to one who is like this”. This reproach, Venkataraman took as an advice that for one who wants to lead a saintly life, the school studies is of no use. He then and there decided to leave the house and go to Tiruvannamalai to pursue his spiritual sadhana there. He did not inform anybody as he knew he will be stopped from going. So, he told his brother that he was going to school to attend a special class at noon. His brother then asked him to take five rupees from aunt and pay Nagaswami’s college fees while going to school. He took it as a good omen. Out of the five rupees, he took only three rupees for his expenses and left the balance two rupees with a note at a place where Nagaswami will find it. He did not say in the note where he is going, but only said,” I have set out in quest of my Father in accordance with his command. This has only embarked on a virtuous enterprise. Therefore, no one need grieve over this act. And no money need be spent in search of this. Your college fee has not been paid. Herewith rupees two”. His matured detachment to his name and form can be seen from the reference to himself as ‘this’ in the latter part of the letter. As he had not the correct idea of the route, he reached Tiruvannamalai partly by train, partly by foot, enduring much hardship on the way. He also pawned his earrings on the way for four rupees as he ran out of money. But he was happy to set foot on the soil of Tiruvannamalai. He straight went to the temple. The doors were open and there was nobody even in sanctum sanctorum. He stood before Lord Arunachaleswara his heart filled with ecstasy. He felt his journey was over and he has arrived. He left the shrine completely self-fulfilled, never to return to it again. From the temple he went straight to Ayyankulam Tank. There he had his head shaved and threw into the tank the balance money he had, after paying the barber. Thereafter, he never handled money. 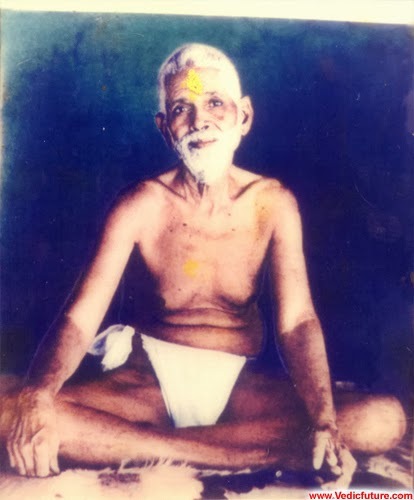 He discarded all his clothes except for a loin cloth and walked back to the temple, as a self- ordained saint or rather Arunachala-ordained saint. He first took his seat in the thousand pillared hall and there he used to sit in meditation for hours together scarcely moving, never speaking. Seshadri Swamigal, another Self-realized soul, a Jeevanmuktha, who was in Tiruvannamalai, saw him and realized his greatness and started referring to him as Brahmana Swami. But this Brahmana Swami could not meditate in peace here, as urchins started pelting stones at him as part of their boyish pranks. So, he retired to Patala Lingam, an underground vault in the thousand pillaired hall. It was dark and cold, infested by vermins, mosquitoes and ants. But, he did not mind it as he had the solitude and undisturbed peace. Even the urchins did not dare enter there. In the Patala Lingam, he went into deep Samadhi and continued in that state for hours and days together. He did not wash, did not speak, ate little and hardly stirred. This continued for weeks until one day one Venkatachala Mudali, a devotee of Seshadri Swamigal carried him out of the place with a help of another sadhu and his disciples. He was in deep Samadhi at that time and hardly noticed his being carried out of the vault and being deposited near the shrine of Lord Subramanya. When he came out of the Samadhi he accepted the change stoically and silently and still did not speak a word. Thereafter a sadhu stood guard over him and also brought him temple prasad regularly during the time he spent there. After a few weeks, he shifted his seat to groves, garden and shrines. Wherever he took his seat the routine was the same- silence and Samadhi state. This continued until he shifted his residence to Gurumurtham at the outskirts of the town, at the request of its keeper, Annamalai Tambiran. Here pilgrims and sightseers flocked to see him and get his blessings and a bamboo palisade had to be erected around his seat to prevent them from disturbing him by touching him. Here he was joined by a sadhu, Palaniswamy, who became his faithful attendant for the next twenty one years. Here only people came to know his name and place and also that he was literate in Tamil and English Here only he broke his silence, but here also he spoke sparsely and sometimes preferred to write down the replies. After a year at Gurumurtham, Ramanaswami as he was known then, moved to the gate keeper’s quarters at a nearby mango orchard, accompanied by Palaniswamy. The owner Venkatesa Naicker left strict instructions that Swami should not be disturbed by anyone without the permission of Palaniswami. So here he had the much needed rest and solitude. Also Palaniswamy brought to him advaitic literature in Tamil. Ramanaswami will read them and give Palaniswamy a summary as Palaniswamy’s mother tongue was Malayalam and his knowledge of Tamil was limited. In this way to help Palaniswamy, he read a lot of books. They gave sastraic confirmation to his Advaitic experience. His uncle Nelliappa Iyer from Manamadurai traced him to this grove and pleaded with him to return to Manamadurai. Ramanaswami remained silent and showed no interest in the visitor. Nelliappa Iyer went back disappointed but informed Alagammal about her son’s whereabouts. Alagammal along with her eldest son came to Tiruvannamalai. By this time he had shifted to Pavalakunru, eastern spur of the hill. Her pleas to come home also went in vain. But this time he wrote in a piece of paper that things will move as per prarabhdha. For him who has lost all attachment to the body, all relationships that come with the body have also lost all meaning. But he was not stony-hearted. The next time when Alagammal came to see him on her return from a pilgrimage and fell ill, Ramanaswami nursed her tenderly with all care and affection. He also composed a hymn to Lord Arunachaleswara that she should recover and also she be weaned from worldliness. Both his prayers were answered. For Alagammal recovered and later she came to spend the rest of her days with him, taking to ochre robes and also received spiritual lessons from him. By that time she came to stay with him he has moved to Virupaksha cave. Here only the great Sanskrit scholar Kavya Kanda Ganapathy Sastry met him and became his ardent devotee. He only declared that Ramanaswami be called Maharishi and he also addressed Maharishi as Bhagawan. He also called him Bhagwan Sri Ramana Maharishi. He composed hymns in Sanskrit in praise of the Maharishi and also wrote Ramana-Gita explaining his teachings. He also translated Maharishi’s advaitic work “Ulladu Narpadu” into Saddarsanam in Sanskrit. Maharishi did not write much and what he wrote mostly was in response to specific demands from his devotees. For example the book ‘Upadesa Undiyar’ in Tamil, which he himself translated into Upadesa Saar in Sanskrit, giving in a nutshell the advaitic philosophy, was written in response to a request from his devotee Muruganaar who was composing a work on Siva Lila in Tamil and wanted Maharishi to write that potion carrying Lord’s advice to Tarukavanam sages, after their pride was humbled. Soon after his mother’s arrival to stay with him, Maharishi moved to Skandaasramam a little higher in the hill. His younger brother also joined him and took sanyas under the name Niranjanananda. Upto now one devotee Echammal has taken upon herself the duty of cooking and bringing food to Maharishi and the devotees who stayed with him. Now in Skandaasramam, Alagammal took charge of the kitchen. Here only an incident happened that showed Maharishi’s creed of Ahimsa and kindness even towards those who harmed him. Thieves broke into the Asramam and finding not much money there, gave vent to their disappointment by manhandling the Ashram mates. They did not spare even the Maharishi. When he received a blow on the left thigh, he told the miscreant without any anger or reproach, “If you are not satisfied, you can strike the other leg also”. Not only that, Maharishi forbade his devotees from going after them saying “they have their Dharma and we have ours. It is for us to bear and forbear”. Later he jocularly commented upon the incident saying “I have also received some puja”, punning on the word in Tamil as Poosai, with the colloquial meaning blows. This spirit of Ahimsa or Himsa varjanam that Maharishi embodied, the animals and birds could sense. They moved freely in his company without any fear. Maharishi also referred to them as ‘he’ or ‘she’ and never as ‘it’. Squirrels would eat off his hand Once to distract the attention of a chasing dog, to save the squirrel it was chasing, he threw the staff he was leaning on and in that process, fell down and broke his collarbone Even on the last day of his life, he was enquiring whether the peacocks have been fed. Pride of place in his affections goes to the cow Lakshmi. On the day she died in the year 1948, Maharishi went near her as she was lying down sick and gazing into her eyes enquired “Amma, you want me to be near you”. He then sat down beside her, took her head on his lap and placed his hand on her head as if giving deeksha. Then holding his cheek against hers, he caressed her. When she died she was buried in the Ashram compound with full funeral rites besides the grave of a deer, a crow and a dog which also Maharishi had caused to be buried there. Even the snakes he would not allow to be killed, wherever he resided. He had said “we have come to their home and have no right to trouble or disturb them. They do not molest us”. And they did not also . He has also remarked in a conversation “we do not know what souls may be tenanting these bodies and for finishing what part of their unfinished Karma they may seek our company”. He did not preach Advaita, he lived Advaita. Maharishi rarely gave a discourse as such. The guidance or instructions he gave to the earnest seekers who approached him was intensely direct and adapted to their character. To Swami Yogananda who asked him what spiritual instruction should be given to the people for their uplift he replied “It depends on the temperament and spiritual maturity of the individual. There can be no mass instruction”. From his writings and recorded interviews, we can extract his teachings. His main emphasis was on Self-Realization The key to Self-Realization is the inquiry into the nature of Self, known as ‘I’, the ‘who am I’ enquiry. In Maharishi’s own words “pursue this enquiry “who am I” relentlessly. Try to find out where the ‘I’ thought begins. Go on with your meditation. Keep turning your attention within. One day the wheel of thought will slow down and an intuition will mysteriously arise. Follow that intuition letting your thinking stop and it will lead eventually to the goal”. When one reaches the goal, the pseudo ’I’, Ahamkara, is destroyed and the real ‘I’, the self evident, ever present real Self, Athma, also called pure consciousness, is realized. Then one realizes that this Self, the real ‘I’ is the only absolute reality, paaramarthika satya, and all others viewed as separate from Self are only relative or transactional realities, Mithya. Then the division between the individual, universe and God or Jiva, Jagat and Iswara disappears and what is there is only the Self that is called Athma in individual and Brahman in cosmic whole. It is this state that Maharishi realized in his death experience at the age of seventeen. His later sadhanas made him stay in that state for hours and days together involuntarily, a perfect Jeevanmuktha, a Brahma-Jnani. This state of realization of the real Self is the end of the road for ‘I’ enquiry or ‘who am I’ enquiry. But this state is not a new state, according to him. It is only a rediscovery of an ever existing state, unrecognized by us due to ignorance (Avidya/Ajnanam). Maharishi himself explains it thus “the state we call Realization is simply being oneself, not knowing or becoming anything. If one has realized, then he is That which alone is and which alone has always been. He cannot describe that state. He can only be That. Of course we loosely talk of Self-Realization for want of better term”. In 1922 his mother passed away. He had her interred with the due rites of a sanyasini and a tomb was erected in that place. For six months he daily visited the place. One day after six months he took up his residence there. That is the place of the present Ramanasramam. In 1948 a nodule appeared below the left arm. It grew in size and was operated twice but to no success. He refused anaesthesia and stayed awake during the operation, such was his detachment from the body. When it was diagnosed as sarcoma and amputation of the arm above the affected part was advised, Maharishi refused stating “The body itself is a disease. Let it have a natural end. Why mutilate it”. The disease wasted his body but his spirit remained as high as ever to the last moment, as he treated the pain and disease as play of prarabhdha on the body. Not only that, to the last moment he was the same simple self as he was, when he first took his seat in the thousand pillared hall of the temple. No luxury or ostentation, only the loin cloth was his dress and limited food was his diet. The end came on 14th April 1950. At 8.47PM the time he shed his mortal coils, people sighted a comet slowly moving across the sky towards the peak of the hill and disappearing behind it. Only his physical presence is not there, but his spiritual ethereal presence is still felt by his countless devotees who flock to Ramanasramam. Earlier in his serene silent presence, devotees found peace and even solutions to their nagging problems. Now it is his spiritual presence that inspires and guides devotees who come to the Asramam. superb commentary on the life and work of Maharishi. Thank you for the wonderful precise on Maharishis life. You have summarized the life and philosophy for easy understanding to a novice.